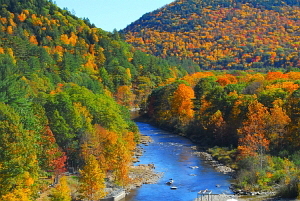 Sitting here in Vermont's beautiful West River Valley, close to many major ski areas as well as the Townshend Dam and Recreation area, it is no wonder there are many, many places to eat and stay in the area. The Townshend and West River Valley area offer many choices of places to eat from grabbing a quick lunch to fabulous upscale restaurants. The same is true for places to stay, from bed and breakfast establishments to campgrounds. Some are located in the village areas, some are nestled well off the main roads. In truth, dinning and lodging choices are really far more numerous than choices in any other business category. Come visit, stay, eat, and enjoy a bit of time roaming around. Be sure to book well in advance, especially during the foliage season, on major holidays, or during major holiday weeks.